South Africans were represented in all branches of the services during the D-Day Landings on the blood-strewn beaches of Normandy on the 6th June 1944, a good number seconded to the Royal Navy from the South African Naval Forces (SANF), and serving principally in little craft like minesweepers, and helping to clear the way for the troops’ landings. In addition scores of southern Africans were flying escorting fighters and bombers with the Royal Air Force (RAF), including Group-Captain “Sailor “ Malan, and No’s 266 and 44 (Rhodesia) squadrons, the former flying Hawker “Typhoons”, and the latter “Lancaster” bombers, while a couple of South Africans also served with the paratroops (“Red Devils”), and some seconded South Africans were also to serve during the landings with the British Royal Marine (RM) Commandos. However, the South African link with the British Commandos goes back many a year, to the Anglo-Boer Wars, and the skilled and mobile Boer or Afrikaans mounted soldiers who fought the British with such cunning and ingenuity, the latter termed “Kommando”, and the man who was instrumental in the creation of the British Commandos was himself a South African, namely Brigadier Dudley Wrangel Clarke, of the Royal Artillery, who was born in Ladysmith, Natal, and who was to base his concept of an elite infantry fighting force on his fellow countrymen, the legendary Boer “Kommandos” (after which the British “Commandos” are named) while in addition, in 1953, the Royal Marine Commandos were also to adopt as their official march, the uniquely South African and Afrikaans folk song, “Sarie Marie”, which is played following the Regimental March on ceremonial occasions. Like most of the British colonies and Dominions, South Africa (and Rhodesia) were to serve unstintingly with their British and Commonwealth comrades during World War II, and during the latter part of the war when Britain needed more and more men (and women) for the various branches of the British armed forces, a sizeable number of South Africans were to be seconded from the South African Defence Force to the British Army, the Royal Air Force and the Royal Navy respectively , and among these were approximately 100 South Africans who found themselves serving with the celebrated “Royal Marine” Commandos, having been seconded to the Portsmouth Division of the Royal Marines in early 1944, and seem also at one stage to have been stationed at Deal in Kent. 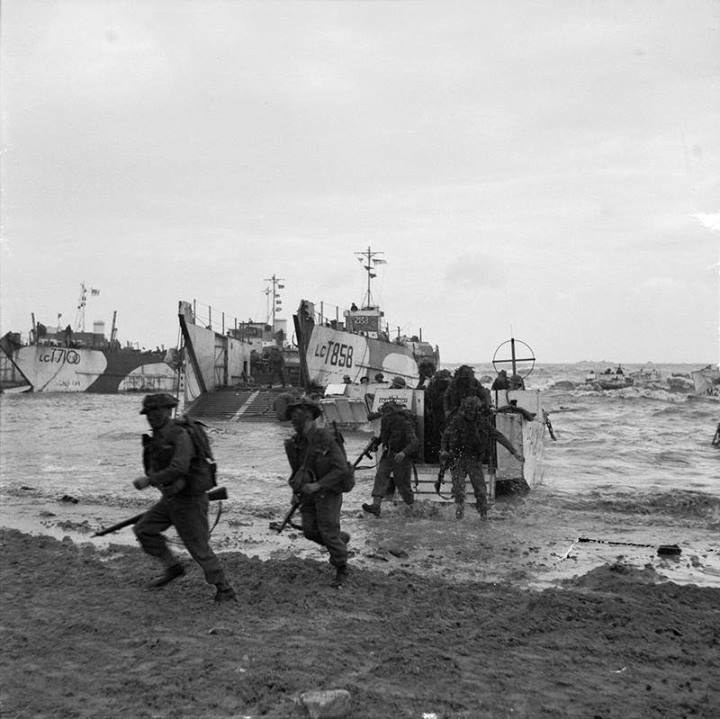 Those South Africans who subsequently served with the Royal Marines (part of the 4th Special Service Brigade) in Normandy during the D-day landings were to distinguish themselves, helping their British colleagues capture Port en Bessin, a small but important harbour in the gap between the original British and American beach-heads. The Germans had strongly fortified the port with a triangle of three strongpoints, and as these were designed to beat off attack from the sea, the Commandos had decided it best to take the position from the rear. This involved a ten mile march against tremendous odds through enemy territory.The landing had originally been planned to take place at Le Hamel, but as the ships closed in they came under heavy fire from a German battery.Before they even touched down, a tad to the eastward of their original objective, they almost met disaster, for five of their fourteen landing craft were mined and sunk.Undaunted they swam ashore with what equipment they could salvage, and during their hazardous march inland they fully rearmed themselves with weapons captured from the enemy. Such circumstances had been anticipated, the marines having been trained in the use of enemy weaponry such as the MG 34 (“Spandau“). As the Royal Marines and South Africans with them struck inland, , they came under a continuous hail of enemy fire.Advancing against machine-gun posts, manned largely by Polish and Russian conscripts, they subdued them one by one.The marines fought their way through, carrying heavy equipment and mortar ammunition (each man carrying a load of “nearly three-quarters of a hundredweight”).To avoid more of these machine-gun posts, which were delaying their progress, the Marines struck across country to a main road south of the enemy battery at Langues.This battery did not attempt to interfere with the commandos, and they reached their objective for the night – Hill 72, highest point on a ridge near Escures, and immediately south of Port en Bessin – and there distributed more captured arms. Then the Royal Navy took a hand, opening a heavy fire on the port (including the guns of HMS Emerald), and this was followed by a fierce strafe from RAF rocket-carrying fighters, and bombers. Finally, guns of the Royal Artillery, away in the British beachead, laid laid down a heavy smokescreen, under cover of which the marines took three strong-points and subdued them after stiff fighting. As they burst into the defences German Kriegsmarine flak ships in the harbour, which had moved in on the 5th June, opened fire with rapid fire cannons, causing casualties.The marines silenced this attack from the rear with a machine gun and mortar fire. A desperate battle was fought for the third and most powerful point. Twice the marines won the positions and twice they were driven off, but the third time their assault succeeded. Even then they had not finished. While the fight for the last strong-point was in progress the Germans launched a strong counter attack from south of Hill 72, the Commandos base. After a heavy mortar bombardment the enemy overran the positions, scattering the commando headquarters and the support troops located there.Most of these troops made their way into the town, where they joined up with the main body of commandos. A machine gun section arrived just in time to support the final attack on the strongpoint, and late that day the marines subsequently “dug in” to defend the hard fought position they had won.The commandos later made contact with the Americans to the west and handed over to them the German prisoners they had captured. The enemy did not attack during the night, and when the marines moved forward in the morning to retake Hill 72 they found that the Germans had withdrawn.The port and Hill 72 were then held by the Marines until Army forces destroyed the battery at Langues and advanced to relieve them. Amidst all of this were the South Africans seconded to the various units of the Royal Marine Commandos. One of these men was Lieutenant Louis Fouche, from East London, in the Eastern Cape, who had initially served with the SA Armoured Corps, before transferring to the Royal Marines. He landed with the marines in Normandy during the D-Day Landings, but was hit after a few hours on the beach, and was evacuated back to England. He was, however, back in France in time for the “big push that started in August”, serving with “Y” troop of No 48 RM Commando, and was also later to land with the RM Commandos during the attack and capture of the Dutch island of Walcheren (2nd October – 4th November 1944), where Fouche was to say that “the Germans fought like devils to hold their ground – at least until the Marines got to within 15 yards of them. Then they stood up behind their guns and stuck up their hands.” Sadly, Lieutenant Fouche was to lose a brother during the war, having been killed while serving with the famous 6th South African Armoured Division in Italy. Another of those South Africans who served with the commandos on D-Day was Lieutenant D.C. “Tommy” Thomas, from Maclear in the Transkei.His most painful recollection of D-Day was the stormy passage he and his contingent had to undergo in crossing the Channel in their landing craft.The seas were running high, and hardly a man escaped sea sickness. They landed in the second wave at first light, their boat receiving a direct hit as they approached the shore, half-a-dozen men being killed, and Thomas found himself up to his neck in water after having jumped form the landing craft as it struck the beach. The Commandos, having “dumped” their steel helmets, promptly donned their green berets as they went ashore, it being “more comfortable”.They had a specific job to do which was to connect up as soon as possible with the paratroops who had dropped further inland, and encountered fire, but “did not wait to deal with the resistance at the coast, pushing inland instead with all speed”. It was “tough going through the minefields but they got there”. “And were the paratroops glad to see us!” remarked Thomas, who further remarked that for the next few days none of them knew much of what was happening, and could not be sure whether the invasion was a success or not. All they knew was “that in their own sector on the left flank of the beach-head they were kept hard at it”, and the toughening they had had in advance was to prove more than useful. According to plan, they kept on the move all the time -”frigging about” as it was called in Commando terminology, snatching some much needed sleep in slit-trenches during the day, while at night they were patrols or raids to be carried out. 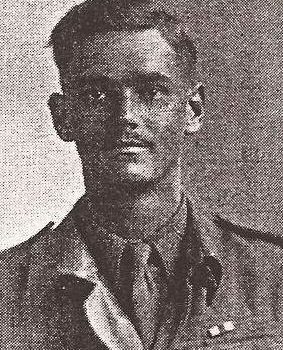 It was while returning from one of these ”nocturnal excursions” that Lieutenant Thomas shared with his sergeant and another man “the benefit of a German hand-grenade”, and was to later return to England with several “little shrapnel souvenirs still in his leg”, but otherwise was “none the worse for wear”. Thomas was also to add that he was wondering how he would “be able to settle down on the family farm in the Maclear district of the Transkei after all this excitement”. 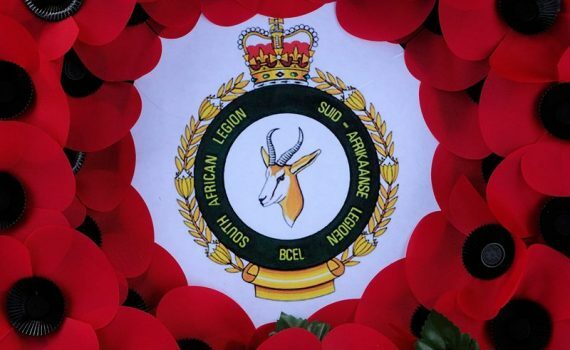 And so seventy years ago, in the summer of 1944, we find South Africans who were not only to partake in one of the most profound days of the history of warfare, but were also to further solidify the South African connection with the famous Royal Marine Commandos, that has in the interim survived the test of time; South Africans serving with the Royal Marine Commandos to this day, in Afghanistan and elsewhere – “By Sea or Land” (“Per Mare Per Terram“). There’s also several South Africans buried not far from the beaches at Dieppe from the raid there in 1942. Richard Shepperton Bate (41 RM Commando, killed Netherlands, 16th February 1945). C. A. D. Bircher, MC. Capt. L. L. A. McKay, MC. Remembering D Day and the extreme bravery of quite a number of South Africans who took part in it. Two South Africans seconded to the Royal Marines were awarded the Military Cross for gallantry on D-Day. This is the citation for one of them Lieutenant Cecil Arthur Douglas Bircher, South African Forces (attached to the Royal Marines). “Lieutenant Bircher was Officer Commanding Troops in a Landing Craft Tank known as a LCT(A) carrying part of his troop. The craft engines broke down and it was towed from a position off the Isle of Wight to the assault area by a LCT and a LCI. On 6th June 1944 when approaching the beach at Bernieres-sur-Mer these craft had to cast off the LCT(A) which was left drifting sideways in a strong tide about 150 yards from the beach. 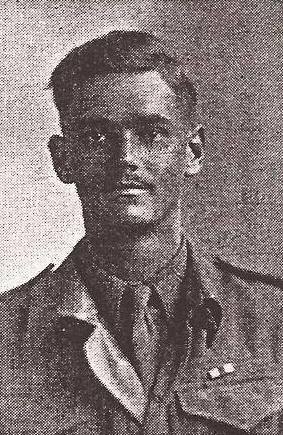 Although there was a heavy sea running and the beach was still under close range fire, Lieutenant Bircher, without hesitation plunged into the water and swam about 100 yards to the shore with the beach lines. The chosen image shows Royal Marine Commandos of 47 (RM) Commando coming ashore from LCAs (Landing Craft Assault) on Jig Green beach, Gold area, 6 June 1944. LCTs unloading priority vehicles of 231st Brigade, 50th Division, can be seen in the background. This is pretty much the situation Lt Bircher would have found himself in with his unit of Royal Marines and their tanks in a LCT awaiting to disembark.